...its IsatData Pro satellite service has been authorized for operation in the territory of the Russian Federation. SkyWave satellite services are provided through FSUE Morsviazsputnik for the territory of the Russian Federation. An operator of Land Earth Stations (LES) in the Inmarsat satellite communications system, Morsviazsputnik is also an Inmarsat Distribution Partner of I4 services, providing a wide range of communication and navigation services including mobile satellite communication services for all transport. 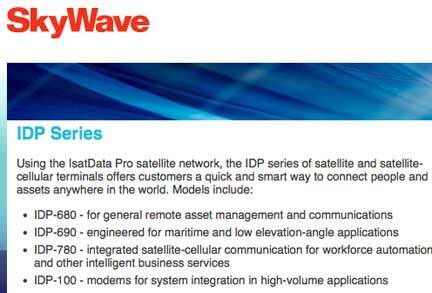 The regulatory authorization of IsatData Pro for the Russian market will open a number of new application opportunities for SkyWave, particularly targeted to industry sectors such as the transportation, mining, rail, heavy equipment and SCADA fixed assets. This latest regulatory authorization further extends SkyWave coverage within Russia, where the company has been actively selling and supporting customers since 2009.